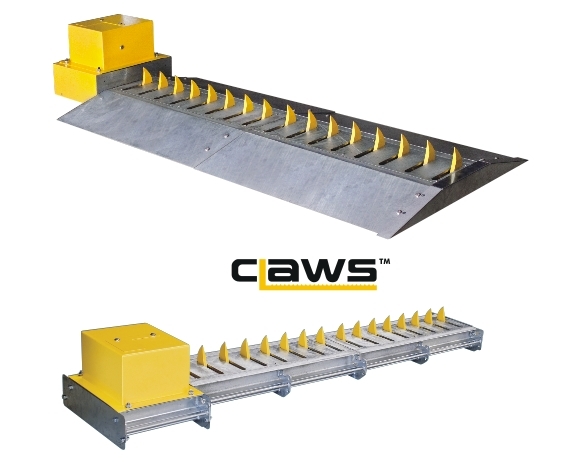 Give your traffic barrier CLAWS – an effective deterrent for high-volume traffic control. Designed to provide a compelling reason for would-be criminals to reconsider their approach; CLAWS are constructed to take a beating but never miss a bit of their own. CLAWS are available in four different configurations. These can be generally divided into two types of categories:Flush Mount models for installations that are flush with the roadway surface, and Surface Mount models for installations that are mounted above the roadway surface. The Flush Mount models are ideal for installations that require seamless traffic control for smooth-flowing traffic, whereas the Surface Mount models are mounted above the general surface surface of the roadway and create a traffic calming bump, slowing traffic for a safer access control point. Both the Flush Mount and Surface Mount models are available in either Direct Drive which utilises the SECTOR barrier’s drive mechanism, or Independent Drive models which have their own drive mechanism and controllers.